His Majesty King Mongkut was born on Thursday the 18th of October 1804. He was the second son of Phra Buddha Lertla Naphalai (King Rama II) and Queen Sri Suriyendra, whose first--born son died at birth in 1801. 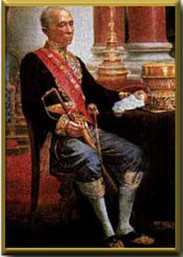 Prince Mongkut was five years old when his father succeeded to the Throne in 1809. In a letter to an American friend before he himself ascended to the Throne, Prince Mongkut explained his name and title as follows: "Chao" corresponds to the English word "Lord", or the Latin word Dominus. "Fah" means the sky, but when used with a person's name it becomes an adjective of exaltation, equivalent to the phrase "as high as the sky". Mongkut means "crown". The name Chao Fah Mongkut thus means "The High Prince of the Crown," or "His Royal Highness the Crown Prince"
When His Royal Highness Prince Mongkut became King, he was generally known in Siam as "Phra Chom Klao", but foreigners always called him Mongkut. Until the age of nine, Prince, Mongkut lived at an old palace on the Thon Buri side of the Chao Phraya River. He was given traditional education befitting a Siamese Crown Prince being groomed to be King. His studies included literature and poetry in Siamese and Pali, the ancient language of the Buddhist religion. He was also taught history and the ancient art of warfare, which included the use of many kinds of weapons and elephant - and horse - riding. He learned the precepts of Buddhism, including the Ten Perfections(parami), namely, alms--giving; morality; renunciation, or seclusion from sensual pleasures; wisdom; effort; patients-endurance; truthfulness; determination; kindness and equanimity. At the tender age of 12, Prince Mongkut was assigned by his royal father to take charge of the armed forces. Assisted by an uncle, he supervised the settlement of Mon refugees who had come into the Kingdom by way of Tak, Uthai and Kanchanaburi provinces. When he was 14, the Prince was ordained as a novice monk for seven months at Mahathat Temple just outside the Grand Palace. Then, when he was 20, he entered the monkhood at the Temple of the Emerald Buddha, the Royal Temple, but later moved to a smaller and more peaceful temple at the edge of the city. The little known Samorai Temple was where he thought he could better pursue his study of Buddhism. Two weeks after Prince Mongkut's ordination to the monkhood, His Majesty King Phra Buddha Lertla Naphalai passed away, and following Siamese tradition an assembly of princes and high officials met together to choose his successor. They elected Prince Chesdabodin as the next King. Ironically, it was his period in monkhood, which required him to take a vow of poverty and self-denial, that gave Prince Mongkut a good understanding of statecraft. It allowed him to meet people from all walks of life, from the humblest to the elite, Thais as well as foreigners. He traveled to various parts of the Kingdom, barefoot, depending on offerings of food and other necessities from the people. From the Thais, he gained an invaluable first-hand insight into their welfare and livelihood. From the foreigners, he obtained precious information about the outside world, especially about technology and and science. When His Majesty King Nang Klao (the name by which Prince Chesdabodin was known when he became King) passed away in 1851, the Accession Council elected Prince Mongkut as his successor. When told of the decision, Prince Mongkut said modestly that he would accept to avoid trouble, and left the monkhood. But once he became King, he immediately instituted reforms which would adapt the country to western ways. Soon after his coronation, it was customary for a king to appoint his deputy, or Uparaj, and King Mongkut chose his full brother, Prince Chutamani as Deputy King. By so doing, he returned to a tradition of the Ayutthaya Kingdom 250 years before and followed the example set by King Naresuan in appointing his younger brother as Deputy King, according him an almost equal status and a coronation of nearly the same splendor. Prince Chutamani thus became known as His Majesty King Pinklao; he was interested mainly in national defence, particularly the navy and the artillery. Since King Mogkut was already proficient in the English language, he was anxious that other members of the Court be likewise trained in this foreign language. Not long after he ascended the Throne in 1851, two missionaries, a Dr.Bradley and a Dr.Jones, received a letter from the Grand Chamberlain, telling them of His Majesty's wish that the ladies of the court be taught English, and asking their help to find teachers. The missionaries assigned their wives, Mrs.Bradley and Mrs.Jones, and a third woman, Mrs.Stephen Matton, to take turns going to the palace to give lessons. On August 13, 1851, a class was started for young ladies between the age of 16 and 21. They were soon joined by princesses from the court of King Rama II, and the class grew to 30. But after three years, the lessons were stopped as the students got bored of being taught only from religious texts and shown pictures from the Bible, in what was seen as an effort to convert them to Christianity. It was then that the King sent word to his Consul in Singapore to hire an English teacher on the condition that she would refrain from teaching religion. Thus, in 1892, Mrs.Anna Leonowens arrived in Bangkok to teach English to the Children of the King of Siam for four years. His Majesty King Mongkut was greatly interested in astronomy. He correctly calculated the time and place of a total eclipse of the sun, which occurred on August 18, 1868, and pinpointed a remote village in Prachuab Khiri Khan, on the west coast of the Gulf of Siam, as the place where it could be clearly seen. The King invited many dignitaries, including the Governor of Singapore, Henry Orde. The French Government sent a large party of scientists. In his letter of invitation, Sir Henry Orde, who came by sea, the King told him to come to the place at "East Greenwich longitude 99 degrees 42' and latitude North 11 degrees 39'." The total eclipse of the sun, which lasted six minutes and 46 seconds, occurred exactly as the King had predicted and the European scientists conceded that he was a brilliant mathematician and real astronomer. His Majesty's effort to learn English at an advanced age and become an expert in a western science, however, met a sad end. The King's pavilion for viewing the eclipse was built on low ground in a mosquito-infested spot. Soon after his return to Bangkok, His Majesty fell seriously ill from malaria caught at the site, and his eldest son, Prince Chulalongkorn, who had gone with him to watch the eclipse. His Majesty King Mongkut passed away on the night of October 18, 1868. It was 64th birthday.